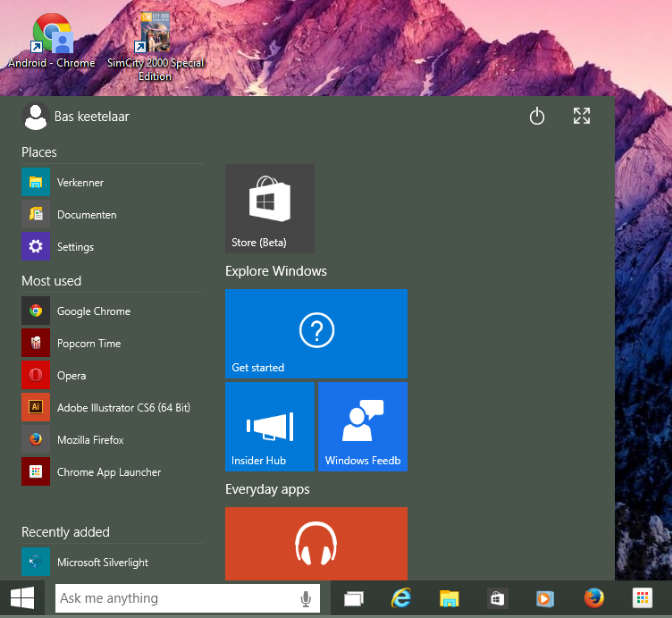 Sooner than expected, Microsoft released a new build of Windows 10 technical preview for Windows Insiders. I waited for the consumer preview, because that version is much closer to the final version that will be released soon. Not everything Microsoft announced at Wednesday’s event will be present in this update, such as Project Spartan, the new web browser. I installed Windows 10 TP on a Windows 7 machine and it was pleasantly easy to do. I remember how I struggled to update my Windows 8 laptop when I got it and in my experience it is easier to get from Windows 7 to 10 than from 8 to 8.1. It was as simple as downloading an .exe file and running it. Everything on my Windows 7 PC was still there. Since Windows 10 will come as a free update for Windows 7 users, I’m sure it will be a painless experience. When I switched from 7 to 8 I thought that I would miss the start menu. In Windows 10 it’s back and I realized that I had learned to live without. With Windows 8 I got used to pressing the Windows key and typing (a part of) the name of the program or app that I wanted to use and press enter. And since the search field is always visible in Windows 10 I’m wondering if I ever need to open the start menu. It’s good that it’s back though, as this will make the transition from 7 to 10 a little bit easier than from 7 to 8. It’s up to you to decide if you want to use the start menu the traditional way or in full-screen, like in Windows 8. With Windows 8, Microsoft tried to build one OS for all platforms and with that came the introduction of apps to the desktop. Personally, I never loved them. With Windows 8.1 they became a little bit more usable, but in Windows 10 they run in windows, like normal programs. This is much more productivity-friendly, so I might be actually be using them in Windows 10. 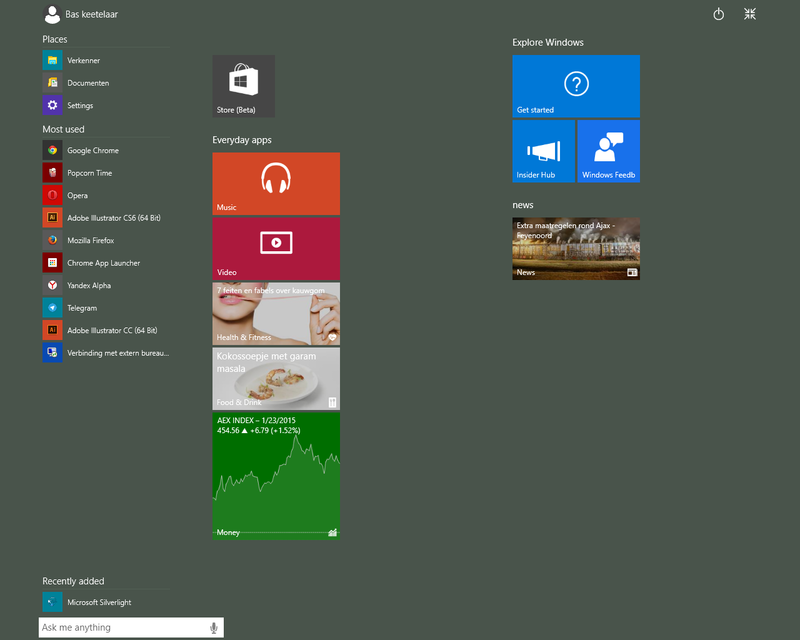 Microsoft merged the settings from Windows 8 and the traditional control panel. Searching for a setting will bring up both results from “settings” and the control panel. However, I think if they want to make this a really good experience they should ditch the control panel, because it’s still confusing where to find which setting. Some settings didn't work for me, like “change the background and colors on start”, but I’m sure it will be fixed. Cortana, the personal assistant that you might know if you use Windows Phone is now available on the desktop as well. I was not able to talk to Cortana, because I got error messages, but she gave me information in a Google Now way, like sports scores, news headlines and information on topics and the weather. “You have to fail to succeed” seems to be the case with Windows 10. It seems to be what Microsoft always wanted to achieve with Windows 8: One OS for all devices. 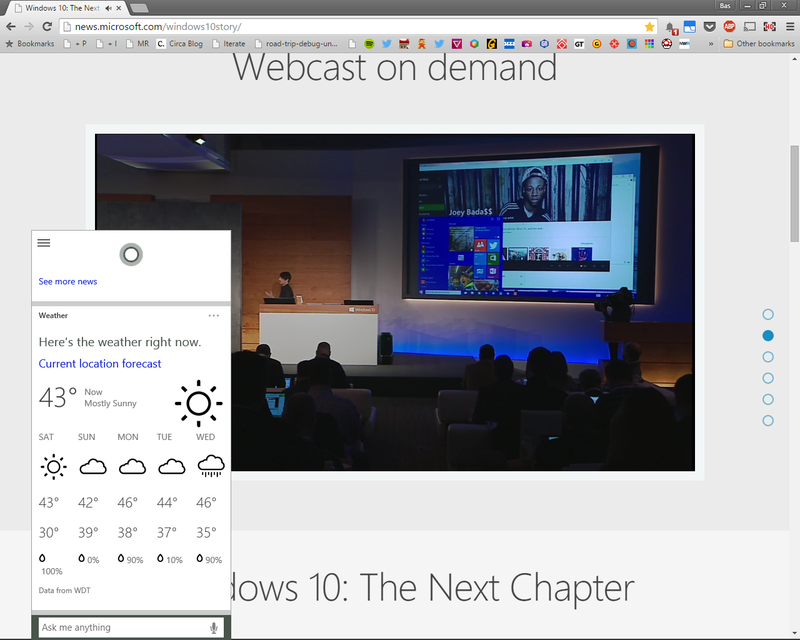 Microsoft sees Windows 10 as a service, rather than a version. Continuum enables you to transform your 2 in 1 laptop into a tablet in a much better way than ever before and with universal apps, developers have to make only one version of their app that runs on all devices. Microsoft chose to develop Windows 10 together with their users to avoid another “8.1" update. Windows 10 is not groundbreaking, but it combines the best of Windows 7 and 8, refining the not so good parts and therefore could become the best OS ever.